After gowning, we’ll have you sit still for a moment or two. Then, starting at the base of your skull, we’ll run two probes down your back. Think of these as miniature radio antennas listening for a distant station. That’s it. The computer does the rest! At your report, you’ll get to see the computerized printout and learn what it means. Because your care is based on the condition of your nervous system, not how you feel, this technology is the focal point of our practice. Dr. Albert has joined a growing number of high tech chiropractic doctors that have upgraded their level of care to better assess the health and well being of their community. People can now be examined by the Insight Subluxation Station, a non-invasive technology which is a neuro-spinal screening and evaluation system originally designed to measure changes in the spinal muscles of astronauts caused by space flight. It is painless, economical, and only takes minutes. Dr. Albert uses the Insight technology to help measure subluxations, which is nerve interference along the spine. This nerve interference disturbs the muscles regular nerve function, causing an abnormal amount of electrical flow to the muscles and create other health problems. 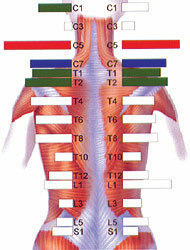 The Insight Subluxation Station measures the electrical flow and charts it, using graphics that show the spine. This helps specify precisely when chiropractors should adjust their patients, allowing for increased accuracy in diagnosis, treatment, and outcomes. Ready to experience this cutting edge technology for yourself? Call us at (414) 982-1854 to schedule your nervous system scan.